#1 Introducing new Hartley’s Fruit in Jelly pots, tasty jelly pots bursting with fruit pieces in a range of scrumptious flavours. Whats not to love fruit and jelly combined i liked the flavour and enjoyed the little pots who are just the right amount for a little desert. #2 Hartley’s 10 Cal jelly pots are delicious and at less than 10 calories per pot fit into even the most restrictive diet, perfect for your New Year’s resolution! Honestly i couldn’t taste much different between those and the normal jelly pots, although i don’t diet i think there a healthier alternative even for the kids! With honey toasted British Oats. I wouldn’t say i love them but there tasted alright and where a nice treat inbetween meals. #4 Our Beloved Bars are 100% natural, no added sugar, and the only cereal bar bound with natural date nectar! They’re made from the finest ingredients, all tumbled gently and cold pressed together to fuse the flavours and lock in the goodness. There are simply no other cereal bars like them. I had those bar just before my first PiYo (Pilates&Yoga combined) class and they where delicious defiantly a great pre or post workout treat. #5 Do you have a soft spot for caramel? Mid-afternoon is just the time for a sweet treat, which is why Divine Caramel bars hit the 3 ‘o clock #DivineSoftSpot! All Divine products are Fairtrade, natural, suitable for vegetarians and free from palm oil. Do I have a soft spot for caramel? Of course i do and who wouldn’t with those delicious and divine caramel bars i wish there where more in the box! #6 Nutribix is a wholegrain cereal. With Gold and Grains we’ve lovingly created what we believe is the crunchiest, tastiest and most delicious breakfast around. Using coconut, honey and the ancient grain Sorghum this makes the perfect choice for anyone who really wants to get going in the morning. I am not a huge soaky cereal bar type kind of girl so they weren’t really my thing. #7 Developed by J2O’s blend masters, the J2O Spritz range has been carefully crafted to combine delicate bubbles with crisp blended fruits. Created specifically for adults, Spritz offers a deliciously light taste experience which at no more than 63 calories per 275ml bottle is the perfect accompaniment to great food. 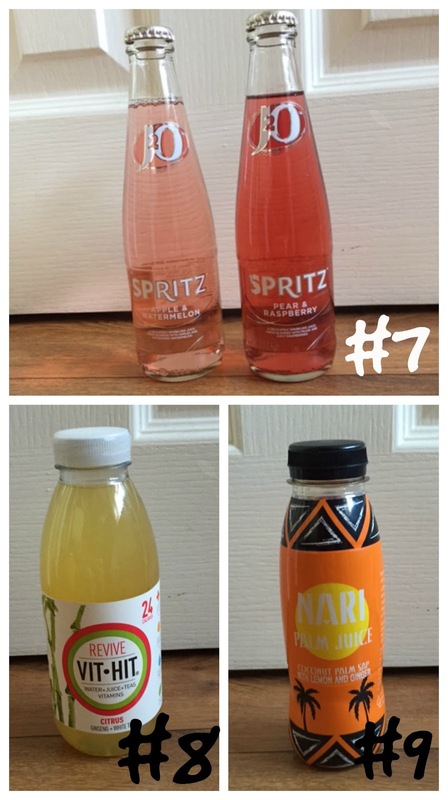 I am a huge J2O fan so i was exited to be trying out the new Spritz and there didn’t disappoint for a non alcohol drinker like me there are great alternative to put in your wine glass for a night in with friends at dinner time. #8 Vit Hit – The Juice based soft drink with 100% Recommended Daily Allowance of 8 different vitamins, no added sugar and with fewer than 35 calories per bottle. With health giving teas and minerals for overall wellbeing Vit Hit contains real juice and no preservatives, artificial colourings or flavourings. Yeah not one for me at all. #9 Nari Palm Juice is coconut palm sap infused with 100% natural fruit and spice extracts. The zesty flavour of lemon and the refreshingly spicy nature of ginger combined with palm juice gives Nari’s Lemon & Ginger flavour its distinguished identity. Nari’s Apple & Mint has an explosive fruit twist; the word refreshing will certainly come to mind. Once again i didn’t like the taste which was mainly down to the fact that it had ginger in it which is not to my liking. 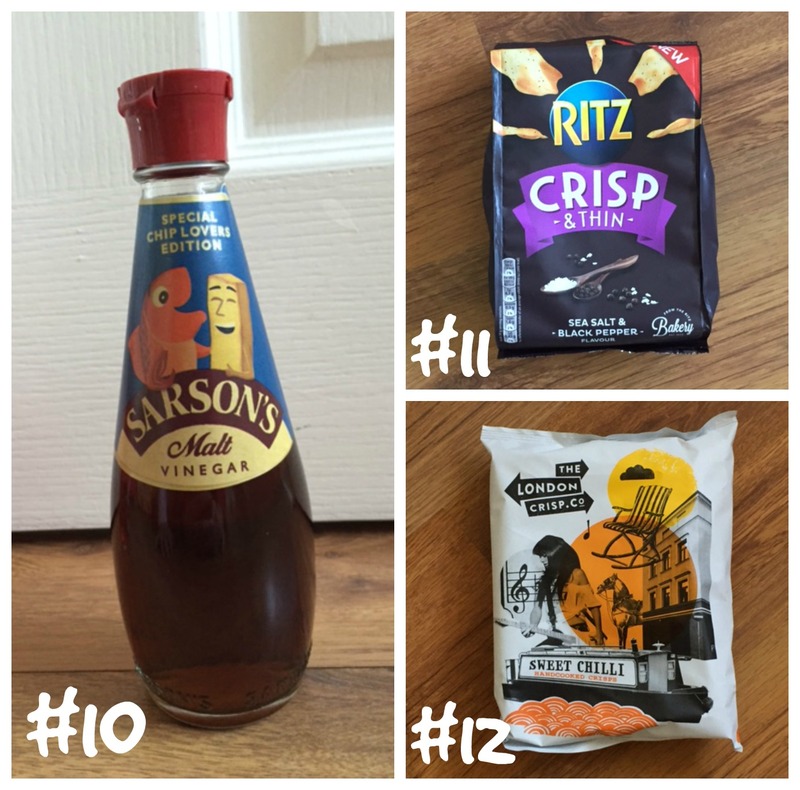 #10 Sarson’s, the UK’s number one vinegar brand, is set to launch a new limited edition Malt Vinegar bottle featuring its well loved ‘Fish and Chip’ characters created by artist Paul Thurlby. Loving the characters on the bottle but i am just to German to like vinegar on my chips but my husband said it was great and is looking forward to another round of fish & chips with vinegar soon! #11 Ritz Crisp & Thin are a delicious new oven-baked potato snack that brings a touch of glamour to any situation, so whether you’re snacking solo or amongst friends you can always Put on the Ritz! I love Ritz crackers so i was eager to try out the new Crisp & Thin’s. I love the texture of them and i defiantly will try some of there other flavours because with the sea salt and black pepper the black pepper taste was a tad to strong for me! #12 Hand-cooked in the heart of the capital, our great tasting crisps combine classic crunch with no-nonsense flavours. Each of our 5 delicious flavours takes inspiration from a different area of the fantastic capital city of London and they can be found in Fuller’s pubs across London! Once again i thought the texture was ok but it sweet chilli wasn’t my preferred flavour. 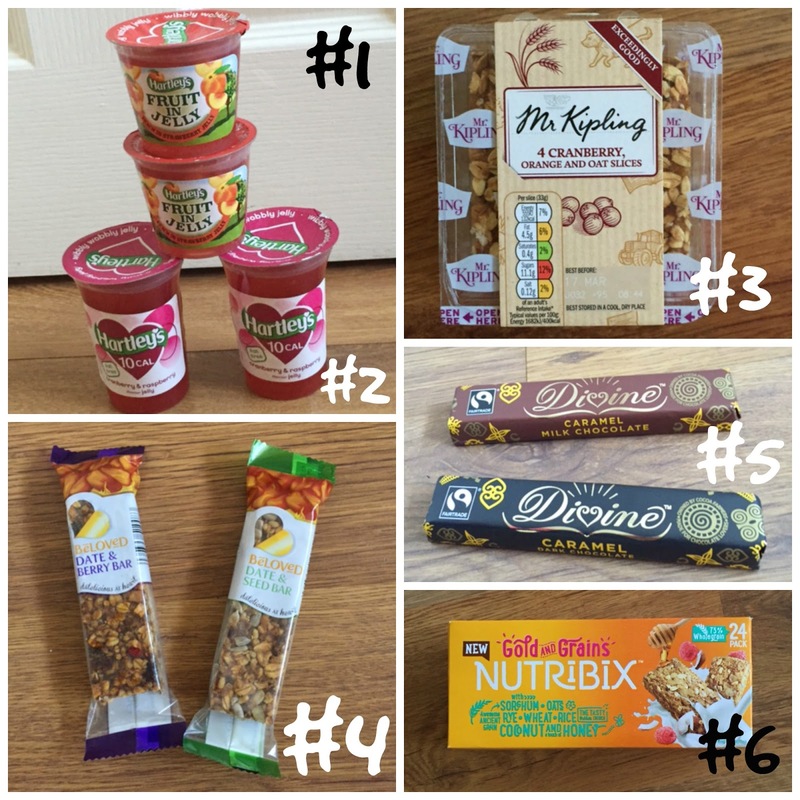 Overall we liked 6 items out of the 12 in the Box. 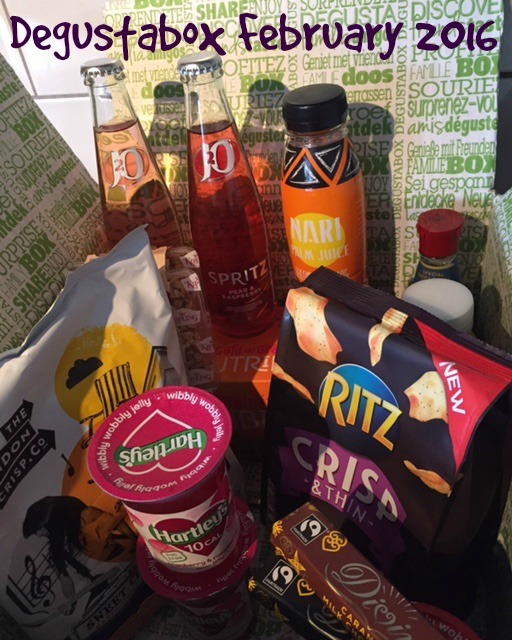 It was a good mixture and the J2O Spritzers and Divine Chocolate where my favourites this month! Disclaimer: I have been sent the February Degustabox for reviewing purposes, but all thoughts and opinions are mine.